Digital boom for global music business – Royal Times of Nigeria. The growth marks the third consecutive year of expansion and the fastest pace since the International Federation of the Phonographic Industry (IFPI), began compiling data, the group’s CEO Frances Moore told reporters on a conference call. But the industry still is only worth about two thirds of its value in the 1990s before the rise of the internet and the scourge of pirated music sent the music business into a 15-year slump, Moore said. The report said that 176 million people around the world paid for streaming subscriptions by the end of last year, with 64 million joining throughout the year — and there is plenty of room to grow on a global level. The IFPI released its data hours before Spotify announced a major expansion of its free, advertising-backed level, which the Swedish company sees as crucial to its hopes of making streaming universal, especially in emerging economies. The industry voiced guarded optimism about China, where revenue jumped 35.3 percent as international labels increasingly penetrate the billion-plus market. “It’s just a question of time. It’s a traditional society and the move toward digital is slower than in some countries,” Moore said. The report, however, warned that more needed to be done to reach Latin American music consumers who lack credit cards — generally a requirement to subscribe to streaming services. The IFPI also repeated its longstanding complaints about a structural “value gap” that allows YouTube to pay less back to artists, owing in part to laws in the United States that shield internet companies from responsibility for content uploaded by users. Despite the industry’s efforts to expand in emerging economies, the top 10 most popular artists of 2017 were all Western, led by English singer-songwriter Ed Sheeran. He led with the record-breaking success of his third studio album ÷ (Divide) and its singles including the global smashes Shape of You, Castle on the Hill, Galway Girl and Perfect. Released in March 2017, Ed Sheeran’s ÷ was the global best-selling album of last year and has been certified as multi-Platinum in 36 markets. Shape of You was the best-selling single globally of 2017 and has been certified as multi-Platinum in 32 markets. It is the first time that the IFPI Global Recording Artist of the Year has had both the best-selling album and single of the year. 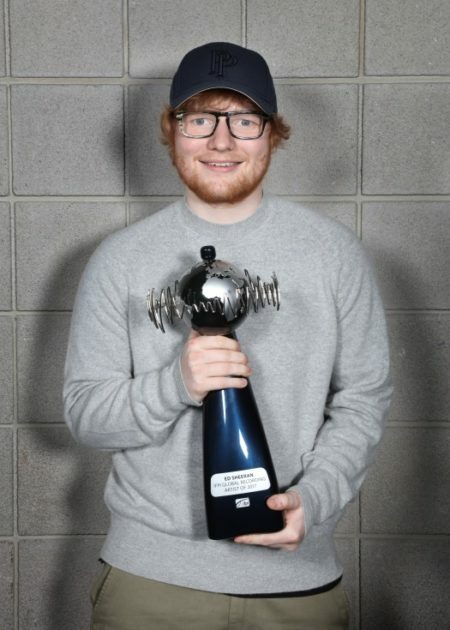 Ed Sheeran is the fifth recipient of the IFPI Global Recording Artist of the Year Award; the unique and authoritative accolade that reflects an artist’s worldwide success across digital and physical music formats, from streams to vinyl. Previous recipients of this prestigious award are One Direction (2013), Taylor Swift (2014), Adele (2015) and Drake (2016).